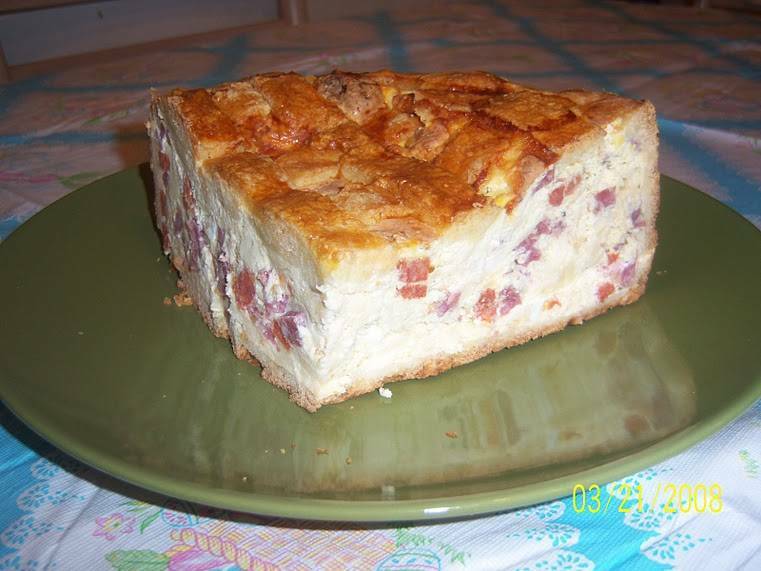 Also known as Pizza Chiene, this Easter pie is full of cheese and meats. When I was growing up, Lent was a time of sacrifice and deprivation. There were no treats of any kind in the house, and we all “gave up” our favorite foods for the duration. Of course, it didn’t count if you gave up spinach or broccoli; it had to be something good to eat and preferably not too good for you -- like chocolate, or ice cream. For a child, 40 days seemed like forever. When Holy Week finally arrived we were full of anticipation for the joy of Easter and the good eating the day would bring. We would go shopping for new spring coats and straw hats and pastel colored dresses. All through the week, my sister and I would color eggs and make baskets, while my mom would concentrate on the baking. On Easter Sunday, the whole family would go to church dressed in new clothes. It was a joyful day. The dark winter was over and the smell of fresh flowers was everywhere. At home, the family would get together for Easter dinner. To start, there was Pizza Rustica, hard cooked eggs, and an unusual appetizer of sauteed calf's liver with vinegar and mint. Next we would have my mom's her feather-light manicotti, then there was roast lamb, artichokes and asparagus. The star of the dessert table was my mother’s Pastiera, the Neapolitan wheat and ricotta pie that is also known as Pizza Gran. It is the recipe she learned from my grandmother, Antonietta Scotto de Fasano who came from Procida. She taught me how to make it and I have taught my neice how to prepare it, too. If you would like my family’s recipe for la Pastiera, please go to my website at www.MicheleScicolone.com. Here is my grandmother's recipe for Pizza Rustica, sometimes called Pizza Chiene (dialect for pizza ripiena or stuffed pie). There are many variations of this pie throughout Southern Italy, some of which are made with a yeast dough, while others have sweetened pie crust. Some cooks add hard-cooked eggs, and every family has their own favorite combination of cheeses and cured meats. The version below, which was published in my book 1,000 Italian Recipes, is the way my grandmother made Easter pie. It is a very rich pie so a small slice goes a long way. In Italy, Pizza Rustica is enjoyed for Pasquetta, the picnic on Easter Monday when everyone heads to the countryside to enjoy the fine spring weather. 1. Prepare the crust: Combine the flour and salt in a bowl. Cut in the shortening and butter with a pastry blender or fork until the mixture resembles large crumbs. Add the eggs and stir until a soft dough forms. Scoop up some of the mixture with your hand and rapidly squeeze it until it holds together. Repeat with the rest of the dough until the ingredients hold together and can be formed into a smooth ball. If the mixture seems too dry and crumbly, add a little ice water. Gather the dough into two disks, one three times as large as the other. Wrap each disk in plastic wrap. Refrigerate 1 hour up to overnight. 2. To make the filling, cook the sausage meat in a small skillet over medium heat, stirring occasionally, until no longer pink, about 10 minutes. Remove the meat with a slotted spoon. Chop the meat on a board. 3. In a large bowl, beat the eggs and Parmigiano until well blended. Stir in the ricotta, sausage meat, mozzarella, and diced meats. 4. Place the oven rack in the lower third of the oven. Preheat the oven to 375°F. On a lightly floured surface with a floured rolling pin, roll out the large piece of dough to form a 14-inch circle. Drape the dough over the rolling pin. Transfer the dough to a 9-inch springform pan, pressing it smoothly against the bottom and up the sides of the pan. Scrape the filling into the pan. 5. Roll out the remaining piece of dough into a 9-inch circle. With a fluted pastry wheel, cut the dough into 1/2-inch strips. Place half the strips 1 inch apart over the filling. Turn the pan a quarter of the way around and place the remaining strips on top, forming a lattice pattern. Pinch the edges of the top and bottom layers of dough together to seal. Brush the dough with the egg glaze. 6. Bake the pie 1 to 1-1/4 hours or until the crust is golden and the filling is puffed. Cool the pie in the pan on a wire rack for 10 minutes. Remove the sides of the pan and let cool completely. Serve warm or at room temperature. Cover tightly and store in the refrigerator up to 3 days.